Rodents roar across the plains. Ferrets launch mortars into farms. In the distance, cobras slither closer, ready to tear down a freshly-built bunker. 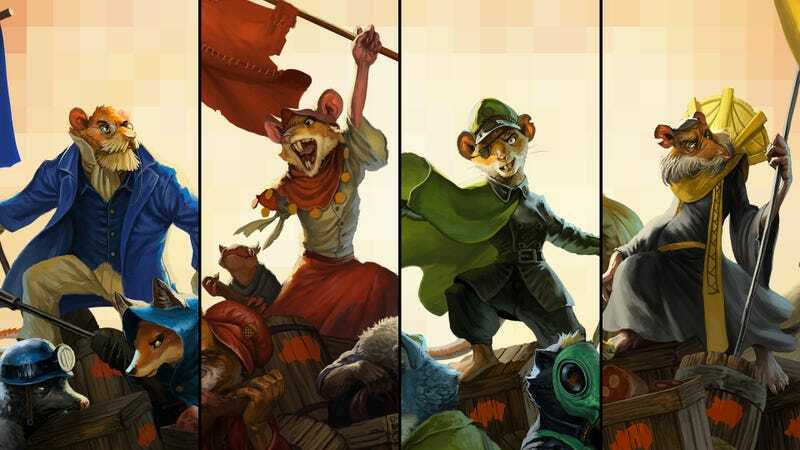 Tooth and Tail is a real-time strategy game that puts you in the commander’s chair of a gunpowder-era Redwall war while trying to avoid pitfalls that keep newcomers from experiencing that splendor. While it overcomes RTS’ mechanical gatekeeping in some ways, those changes can also feel unwieldy in the hands of someone familiar with strategy games. Nevertheless, it manages to be a refreshing take on a genre that’s always open for more unique interpretations. Tooth and Tail, from Monaco: What’s Yours Is Mine developer Pocketwatch Games, is a distillation of the real-time strategy genre to something that’s simplified, concentrated, and playable on a controller or mouse and keyboard. It’s on both Playstation 4 and PC, and features a single-player campaign, as well as casual skirmishes and multiplayer. Working around the complexity of titans like StarCraft, Tooth and Tail’s units only have a few commands, buttons, and abilities, making it easier for newer players to wrap their head around their army composition. The Longcoats are more bread-and-butter generalists compared to other factions. The battles of Tooth and Tail take place in a world of talking animals, as you flit between the different political factions vying for food and land. The single-player campaign’s story starts out revolving around a Longcoat commander whose son was eaten by enemy forces. From there it branches out to the other factions, giving a broader sense of the state of the world. Crop shortages have led to the animals eating meat, but the issue of who becomes that meat has led to civil war. Names like the Commonwealth and the Longcoats stir revolutionary themes, while the KSR are like the woodland KGB. Imagine if Watership Down had rifles, and you’re pretty close. Most commands are simplified to single button inputs. You control a single commander on the field and urge your army forward and issue commands from their perspective. A single press initiates a charge forward, while a held press means retreat. If you’re next to an enemy, your troops will focus-fire that target. Fresh soldiers for the frontlines spawn from warrens, fueled by the food harvested from farms built around gristmills that you can claim on the map. The building blocks are clear: base, resource, unit production, soldiers, enemy base. These elements are chiseled down to their core essence, so you spend less time building additions and researching tech, and more time throwing units at each other. Many genres have their own contrast between players who make furious attempts at progress versus calculated action, and getting the former to develop into the latter is the key to onboarding fresh players. In fighting games, you have button-mashers; in rhythm games, it’s the friend who beat the crap out of your Rock Band drums. Strategy games can spur on folks who just want to attack-move massive armies into bases and watch the explosions. Not all players want to micromanage their units with esports-level efficiency while flipping through tabs and queuing up more production. They want to make a horde and send that horde at the enemy. Numbers are helpful, but having a higher tier unit in a battle can make a huge difference. Tooth and Tail’s game’s presentation builds up those explosive battles with plenty of carnage, along with a swelling score that’s stronger than most. Unit variety ranges from low-level infantry to hero units like the cronie-dropping Matriark or Uncle Butter, a flamethrower-wielding hog. Each stands out visually and mechanically, and whether in missions or skirmishes, finding the right mix to make up your force feels satisfying. Tooth and Tail is effective at giving players the tools to create hordes out of these various types while still forcing them to think about the best way to go about it. The game tricks tunnel-visioned commanders into thinking about concepts like economy and army composition. Food fuels everything, so having productive farms and extra gristmills will keep your numbers high. Spend too much time expanding your economy, though, and your opponent can run over your defenseless troops. Bunkers only go so far in holding back assaults; Tooth and Tail is primarily about making the most of the units you have and keeping an influx of them coming. Composition becomes key when you’re throwing large groups at each other. While the ferret mortar crew is certainly useful in breaking down static defenses, it folds against chameleons and other nimble, sneaky units. Having some squirrel infantry to support your long-range assault is key, but then you might be prone to an attack from the sky. Having the right number and variety of units is a common concept in competitive strategy play, but Tooth and Tail makes it easy to understand by not providing an overabundance of unit types. Uncle Butter does NOT mess around. While newcomers might find the game’s systems approachable, strategy veterans can feel stifled at times. The lack of direct control over units can be felt, especially during a certain story mission that limits you to a small insurgent force with no buildings to produce reinforcements. While you can control each unit type as a separate group, you can’t create control-groups of mixed units like you could in StarCraft. The commander options can regularly feel limiting as well, as the only means of assault are headfirst charges at the enemy. Flanking or fighting on multiple fronts just isn’t quite as possible as it is in more complex strategy games. But the idea here isn’t to necessarily facilitate that level of strategy. Pockewatch Games calls Tooth and Tail a “popcorn RTS,” and it’s an apt description. Matches are closer to 10 minutes than 30, maps are procedurally generated, and multiplayer can be online or split-screen couch battles. Spectator and replay options add some nice tools for practicing your multiplayer strategies. The quick, one-and-done nature of matches makes it easy to keep saying “just one more” as you live and learn from each contest. In one, I tried and failed to beat my opponent early with a risky all-in. But instead of surging back and defeating me, my adversary expanded unnecessarily, spending precious food on new mills instead of units. I did the opposite, and their bases were gradually toppled by my resurgent army while they sat there, storehouses full of food, unable to stop it. Tooth and Tail isn’t an incredibly in-depth experience, but it distills the more unapproachable aspects of strategy into something that works for most skill levels. It can get frustrating at times not being able to manage raid groups or launch multi-pronged assaults, but if the tradeoff is something that’s easy to hop in and out of, with less investment and a quicker inroad to the explosions, then it’s a trade worth making.